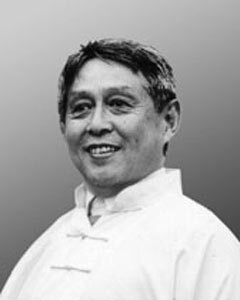 When Dr. Shen Hongxun (°Shanghai, 1939 - 2011) was 11 years old he already studied Yang style Taijiquan with Professor Yao Huanzi. Later he also followed lessons with a family student of the Yang family, master Tian ZhaoLing. He also studied other systems such as Chen style, Hao style and Sun style with some of the best masters of that time. Because he was still young and had very good teachers he developed very quickly. He started teaching at the age of just 15 years old. One day a man approached him in the park. He had noticed that Dr. Shen conscientiously practised every day, and he offered to share his knowledge with him. This man, Xia ZhiXin, taught Dr. Shen traditional NanPai Taiji, based on standing postures and spontaneous movement. Dr. Shen was a doctor by profession and he studied Western medicine. His way of teaching Taiji is different from others in that he used spontaneous movement and empty force (internal force made external). This helps the students to quickly activate the dantian and open the energy channels. What is also characteristic in his teachings is the use of Taiji forces for treating ill health and not just for fighting. Dr. Shen Hongxun passed away in October 2011.